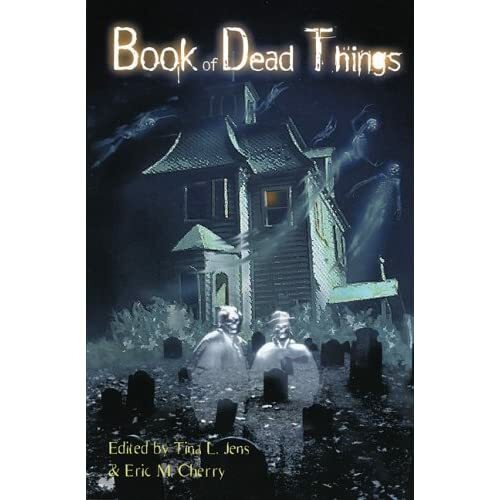 So I found Book of Dead Things over at Amazon.com, which was fun to see because I got to see my name up on Amazon.com (yay!). As a reminder . . .
I’ll be at my first book signing on Sunday! This weekend marks the debut of BOOK OF DEAD THINGS, an anthology featuring my story, “Blood, Snow, and Sparrows.” The book will premiere at Printer’s Row, a Chicago book fair, on Saturday and Sunday (the 9th and 10th). Look for the Twilight Tales booth (our booth location is W3&4. We’re on Dearborn, about a 1/2 to 3/4 of a block north of Polk Street). I’ll likely be at the booth on Sunday from 2-4 pm. There should be authors there throughout either day to sign copies. But the fun doesn’t stop there, puppets—oh no, no, no. The official debut party for THE BOOK OF DEAD THINGS will be held afterwards, on Sunday, June 10th from 6 – 8:30PM at VILLIANS BAR & GRILL 649 S. CLARK, CHICAGO, IL. There will be free food, cash bar and door prizes. Many of the authors from both books will be there to sign books (which will also be for sale if there are copies left over from Printer’s Row). For more info on Printers Row, and transportation info, check their WEBSITE. For more info on the book and the debut party, check out TWILIGHT TALES.